One of the benefits of servicing a vehicle yourself, beside the cost saving, is that you can service individual components at the optimum time based on actual condition and usage. Whereas the CBS (condition based servicing) computer can make predictions, I can look at the actual components and decide if they need replaced or not. I can then replace individual parts as required instead of trying to group them efficiently into specific mileage or time-based chunks to justify a visit to a garage. The i-Drive was still showing 7000 miles until the next CBS scheduled oil service but since I don't believe that it is optimal for an engine to be running for 19000 miles on the same oil, I decided to change it every 12000 miles instead. I'm still using top quality Castrol Edge BMW LL04 approved synthetic oil and genuine BMW filters so this isn't cheap but hopefully will pay me back in the long term by protecting my turbos and engine internals for longer. As before I got a genuine BMW oil filter, o-ring and sump plug washer from a dealer although the part number is different to last time. I think the only difference now is that the o-ring and washer are included in the service kit instead of being separate. I also got my oil from Halfords using my trade card as before. 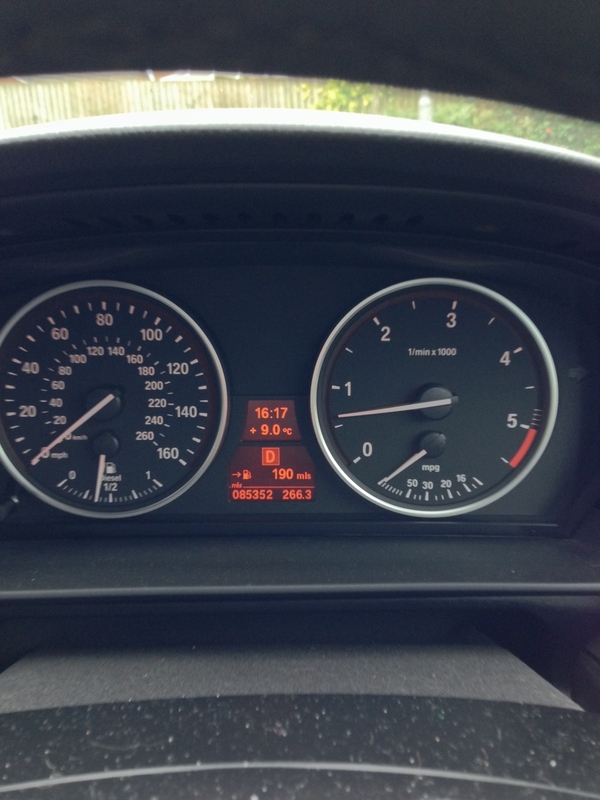 Ideally take the car for a brief drive to warm up the oil but allow to cool a bit before starting work. Use gloves to avoid getting oil on hands. Raise right hand side of car and support safely with axle stand. Use 8mm hex socket to remove three screws on sump plug access panel and remove panel. Use 17mm hex socket to remove sump plug and drain oil into suitable container. You will need between 7 and 8 litres of capacity so be aware of this! When oil drained fully, renew sump plug washer and clean sump plug and sump before reinserting. Be very careful not to over tighten the sump plug. Replace access cover and lower the car. Using a 32mm hex socket, carefully remove the oil filter cartridge. Remove and discard the old filter and fit new filter and o-ring. Ensure they are seated correctly and coat the o-ring with fresh oil. Pour a litre or so of fresh oil into the filter housing and try to get the new filter down into the oil without spilling over. This should help to achieve oil pressure sooner on initial startup although I suspect this isn't really necessary. Just an old habit of trying to prime the new filter. Tighten the filter housing carefully to the specified torque of 25NM. Do not over tighten! Fill the engine via the oil filler cap with a total of around 7 litres of oil (including any that you put down the filter housing. Do not overfill as it is a real pain having to remove excess oil. If you overfill the i-Drive will detect this and warn you. There are conflicting reports as to the capacity of oil required in these engines so start at 7 litres and add as required until the i-Drive and dipstick report the correct level. Note that this level can only be determined when the engine is HOT. Clean up any dribbles of oil around the engine and work area and test drive the car, watching the i-Drive oil level screen. You need to drive something like 6 miles for this to update if I remember correctly. Top up as required but don't over fill. No autumn leaves this time. Filters are good for the summer. Will replace annually. After changing discs and pads last weekend, I decided to check my brake fluid level. It was a little high so I removed some fluid. Also cleared scuttle drains.